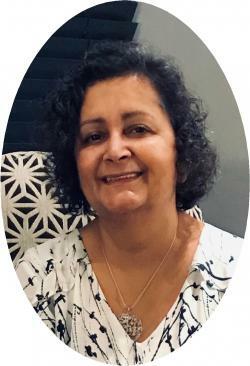 The death of Rayné Jeanette Plettell-Kenny occurred unexpectedly on Sunday February 3, 2019 at the age of 59. Her heart gave out while caring for her mother in Lethbridge, Alberta. Rayné graduated from the University of Lethbridge with a degree in English Literature in 1984. That summer she left her rocky mountain home for the sandy shores of Prince Edward Island where she quickly fell in love with the ocean breeze and the welcoming Island community. Upon arriving she was hired at Pat’s Rose and Grey on Victoria Row, a restaurant owned by the Kenny family. Here she met Morgan Kenny, who proposed to her on their first date, to which she replied, "You’re crazy!" Soon after they were married and settled on the Island where they lived and loved their four children and dog Gracie Gru. As the homemaker she was a sage counsellor, sincere listener, compassionate mother, a woman of great faith. As a faithful Catholic she loved Jesus as her Lord and Saviour and faithfully practiced her religion in an age of disbelief. Her children and husband will remember her as the perfect synthesis of the modern and the traditional. She was grateful for her career at Veterans Review and Appeal Board where she served the public for over 30 years. A true professional in every sense, she showed the team members that she led and the veterans that she served the dignity, respect, and care they were due. As a manager, she brought order to chaos, clarity to confusion, and she did so with gentleness and humour. A lover of words, poetry and prose. Her appreciation for art, music and dance delved beyond the surface. A fabulous hostess who loved to entertain guests, she was talented in the kitchen––we will miss her curries. Beloved wife of Morgan; cherished mother of Rory, Rufus, Dana, and Lorelei; and dear grandmother to Lyncon and Lucas. Rayné will be missed by her mother Dorothy Plettell, brother and sisters – Don Plettell (Aline), Vanessa Plettell-Chevrier (Jacques) and Carolyn Burton (Keith). She is predeceased by her father Geraint Plettell, and she will be missed by numerous other family members and friends who loved her dearly. Resting at Hennessey Cutcliffe Charlottetown Funeral Home, Charlottetown. Visiting hours on Thursday February 14th from 4:00 to 7:00 p.m. The funeral mass will be celebrated by her son Fr. Rufus on Friday, February 15th from St. Dunstan’s Basilica at 10:30 a.m.If so desired, memorial contributions may be made to the Knights of Columbus Foreign Missions Fund.